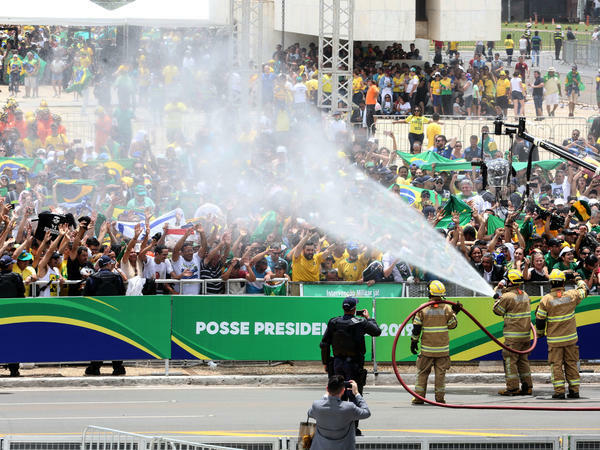 Brazil's President Jair Bolsonaro and his wife Michelle Bolsonaro head to the National Congress for his swearing-in ceremony, in Brasilia on Jan. 1.
spray water to cool down supporters of Brazilian President-elect Jair Bolsonaro, as they gather to wait for his inauguration ceremony. Secretary of State Mike Pompeo joined the conservative leaders of Israel and Hungary at the swearing-in. President Trump congratulated Bolsonaro on Twitter. Bolsonaro's path to the presidency was nearly cut short in September when he was stabbed in a knife attack while on the campaign trail. But he continued to rally supporters from his hospital bed. His huge victory delivered a humiliating riposte to political pundits who, for much of his campaign, portrayed Bolsonaro as a showboating maverick who was about as likely to become president as he was to play in Brazil's star-studded soccer team. Bolsonaro, 63, takes charge amid a wave of optimism about his presidency among Brazilians who yearn for a solution to the country's chronic epidemic of crime and corruption. 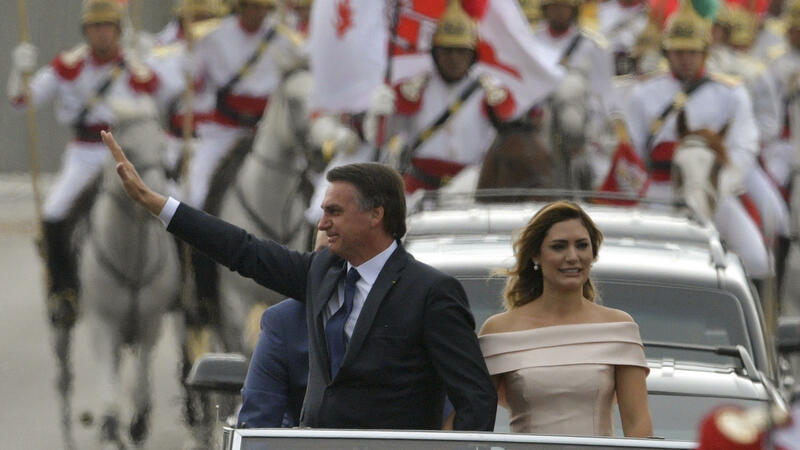 They warm to his promise of restoring traditional Christian family values and are profoundly disillusioned by the leftist politicians who have governed Brazil in recent years. But his right-wing politics have made others in Brazil nervous. Some gay Brazilians rushed to marry before Bolsonaro took office; while he now says he doesn't have a problem with homosexuals, he previously called himself a proud homophobe and said he's rather have a dead son than a gay son. Bolsonaro also directed his incoming foreign minister to cancel a global environmental conference the country was set to host, as NPR's Merrit Kennedy has reported. Speaking with the Associated Press, Bolsonaro said "environmental politics can't muddle with Brazil's development." On Saturday, Bolsonaro tweeted that he would work to ensure every citizen without a criminal background can own a gun; he had previously said "good guys" with guns would help reduce violent crime in the country. Bolsonaro has spoken admiringly of Brazil's military dictatorship in the 20th century, and promised a "cleansing" of his political opponents that would "wipe them off the map." But after his inauguration he spoke of peace for the people of Brazil and promised to respect democracy, according to Reuters. "We have a great nation to rebuild," Bolsonaro said.